Dual-diagnosis. Co-occurring disorder. Bipolar alcoholic. That‘s how I’m branded. I used to deal with my alcoholism and bipolar disorder as two separate and distinct issues-intensive step work to deal with alcoholism and mindlessly taking meds for the bipolar disorder. Then four years into my permanent sobriety I got the hair-brained notion (which I regrettably picked up in the rooms of recovery) that meds weren’t necessary. I trusted that a Higher Power would strike me sane because I was such a stalwart pupil of the Twelve Steps. It never entered my mind that perhaps that Higher Power had inspired those who created efficacious psychiatric medications. It never entered my mind that someone as powerfully awesome as myself shouldn’t be making medical decisions. All went well for a season, but there was the inevitable psychotic break that someone as chemically imbalanced as I am was destined to experience. In the midst thereof I found myself up at a rental property surrounded by a SWAT team while being observed by a helicopter circling the house in the blistering hot Arizona sky. For months thereafter, in those half-dreaming moments of just awakening, I‘d hope that this little scenario was just a cruel false memory stemming from the psychotic break … but then I’d feel the bite of the ankle monitor against my skin and be reminded it was all too real. As I pieced my life back together, I decided to work on recovery as a whole–not focusing solely on my alcoholism. I found myself with a renewed focus on the Twelve Steps of recovery but keeping in mind that recovery meant addressing my bipolar disorder as well. There was a special emphasis on Steps Six and Seven as I sought release from defects of character like pride that led to my decision to stop taking meds. Instrumental in this renewed focus on Step work was Marya Hornbacher‘s thoughtful and beautifully-written Sane: Mental Illness, Addiction and the Twelve Steps. “I remember the first time I read the Twelve Steps at an Alcoholics Anonymous meeting. I sat down with my cup of coffee, avoiding everyone’s eyes, and stared at the steps on the wall. I made it through Step One all right-didn’t make a lot of sense to me, but I got the general idea-and then I came to Step Two: Came to believe that a Power greater than ourselves could restore us to sanity. I tripped over the word sanity, nearly laughed out loud, and then nearly cried. “Sanity” was not something I was particularly familiar with. I have a mental illness, bipolar disorder, and that in itself had taken the sanity I desperately wanted away from me time and again. Compounded with years of the insanity of alcoholism and addiction, I was, at that time, pretty well convinced that sanity was something I could never hope for. I sat there as that AA meeting was called to order, slumped in my chair and wondering if I should just walk out. I thought there was no way I could ever have what the people around me seemed to have-laughter, companionship, stability-and sanity. Chapter by chapter, step by step Marya speaks to the estimated forty percent of alcoholics and addicts who also struggle with mental health issues. Though careful to point out that the Steps don’t “cure” mental illness, Hornbacher offers a sound, back-to-basics take on the Steps infused with suggestions on how they can be practiced by those who deal with mental illness. 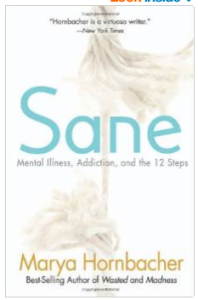 Though Sane: Mental Illness, Addiction and the Twelve Steps has been out for a while (coincidentally it was published in 2010, the year that I was arrested in sobriety) it was a no brainer to be the first book I promoted on this blog. I always appreciate different takes on how the steps should be approached, but it was her insights on how those working to maintain mental health could view the steps that held my interest. For example, when talking about amends, Hornbacher explores differentiating between harm we did because of our addiction, harm we did because we didn’t work to maintain our mental health and the inadvertent harm stemming from being chemically imbalanced. All the guidance on working the steps is infused with her first-hand knowledge of how mental illness comes into play. It’s an added bonus that Marya is a gifted, Pulitzer-nominated writer. I have enjoyed all her works, including a critically acclaimed 2005 novel, The Center of Winter, and will likely be posting additional reviews with her name attached. Enjoy and be edified. I’ve had recurrent deessrpion for decades, sometimes lasting a month or two, sometimes a year or more. The worst for me is how much my deessrpion hurts on the inside, how much it makes me loathe and hate myself — but that’s the deessrpion screwing up the chemicals, the neurotransmitters, in my brain and telling me lies. It really makes me feel hopeless, though, makes me beat myself in the head. The most recent episode, Depression led me to go shopping for a weapon because I just didn’t think I could hold on any longer. I decided to go into the hospital because I knew I would die if I didn’t. This was last year, after 3 years of worsening deessrpion, despite meds and therapy and all. I’m healthy now. though, and glad I’m alive. It is, indeed, crucial to remember that you will feel better someday and that the negative messages your brain tells you are NOT true. And to keep asking for help when things are bad. Was this answer helpful?